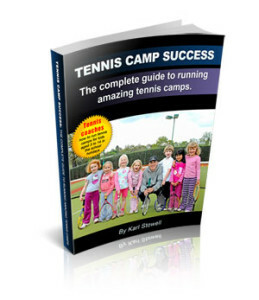 I have run tennis camps for several years now with great success. It’s such a win-win thing. The parents are happy because their kids are doing something worthwhile all day long in the school holidays, the kids love it (if your camps are good), the club or venue benefits from the income and exposure, the coaches get consistent work right through the holidays and…………..you as the organiser can make a LOT of money. I hesitated before writing that last sentence as money is seen as a dirty word by some people. There are connotations of ripping people off and providing a low quality service – too many kids, inexperienced coaches, kids standing in a line waiting to hit a tennis ball. I am NOT advocating any of the above. It is possible to run amazing, high quality tennis camps where everyone ends up happy – parents, kids, coaches, you – AND make very good money as well. It can even allow you time off as you can set up the camps so that they can run without you – this must be done properly of course. My camps didn’t start off successful – in fact the first year made no profit at all. But then with some tweaks and some trial and error, I really learned the right way to do it – and I’ve stuck to the winning formula for several years now, running camps in all school holidays which fill up with children without fail. Marketing- how to market your camps so they fill up! I’ve included loads of bonuses with the book – things which will help you in the running of your camps – registers, database, promotional materials, risk assessment forms, coach training – and more. The cost for the lot is only $17 right now. It’s delivered digitally so you will receive it almost instantly. I’d love to hear what you think of it. Please comment / ask questions below and share using the buttons. Theres no link for buying the book, is there another way to get it ? ?